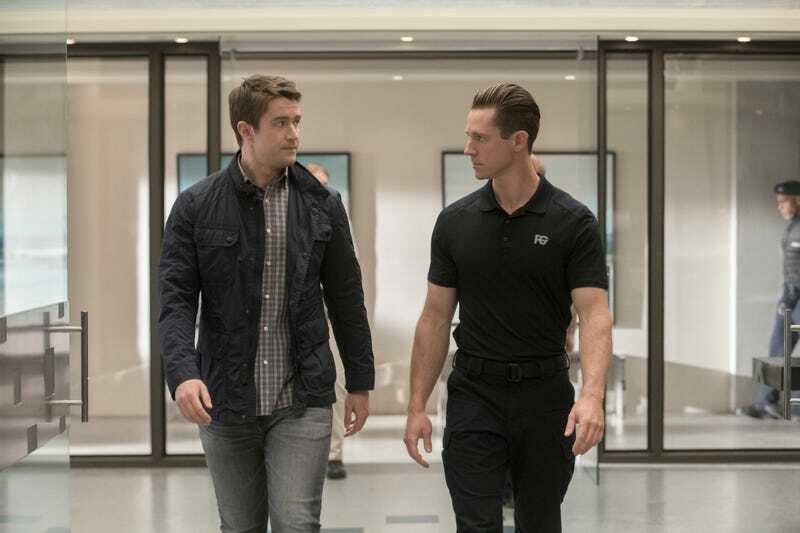 In terms of moving this season’s stories forward, “Insane In The Germ Brain” is one of the more successful episodes in this second half of this iZombie season. So many different stories either come to a head or move significantly toward their inevitable end and the result is a completely stuffed hour of things that feel mostly meaningful, if a little too busy. It all moves along until the last eight minutes, when things veer off course and turn very weird, knocking the whole episode out of alignment. It’s fascinating in its oddness, at least. The strangeness of those last eight minutes comes not so much in content, but in execution. The story choice to have Chase lose control and shoot Major’s team is an extreme one, but you can at least see the little seeds the show has been planting for all of the things that take place during the scene. The thing that turns it from a fine-but-potentially-rushed story beat to an over-the-top, surreal choice is the use of slow motion and an overwrought orchestral soundtrack. It’s jarring and tonally so inconsistent with the rest of the episode in a negative way that it completely saps all of the emotional energy and urgency from the scene, which is the opposite of the intention. It’s a big stylistic swing for the show to attempt, but unfortunately the result is a miss (and a mess). The actual story beats that lead up to this discordant scene are decent, however, and at times a lot of fun. Major and Chase tricking Russ into getting them a meeting with his boss is cleverly done, as is the choice to have Major shouting during the entire scene with the boss only to reveal that he was wearing earplugs the whole time as he sets off a flash bang and has all the smugglers arrested by his team. Little touches like these are what makes iZombie such a fun show to watch, and those elements were certainly present here. This also represents the first real plot movement on the brain smuggling story, which has been hanging out in the background of the entire season and existing mostly as a catalyst for the brain shortage. The ultimate purpose of the story in this episode is clear: to wrap up the brain smuggling issue (at least for now), and to give Major pause regarding Chase and Fillmore Graves. The former is handled well enough and even complicated in an interesting way by Russ’ escape at the end. The latter is feeble, at least given how much time and energy the show has devoted to Major’s juvenile delinquent training program this season. It could get turned around in the next two episodes, but it’s hard to ignore how sloppy Major’s character arc has been handled throughout the entirety of this season. The slow motion interlude doesn’t stop with Chase’s shooting spree; it transitions from that directly to Angus preaching at church while someone charges in and attempts to assassinate him. Tonally, the slow motion and orchestral soundtrack fit in a lot better with this story than the last. The issue is that the whole scene is so incredibly strange and out of the blue that it feels totally tacked on. Yes, this comes after Brother Love’s message gets sent out to the world via the wonders of Don E and YouTube. But to have someone immediately try to assassinate him, and that person be Tucker’s human friend (remember him)? It’s odd, and it doesn’t work. The idea of spreading Angus’ message via videos on the internet is a great one, and adds a level of tension to the overall show that is needed if they are going to push the humans vs. zombies war as the season comes to an end. But to kick off that war with such a disconnected assassination attempt scene is not very successful, and the final minutes of the episode suffer for it. The final big story of the episode is Isobel and her death, and frankly I am not quite sure what to think about this one. Isobel’s presence was always pleasant but confusing, as other than being a potential key to a miracle vaccine she really only ever existed to die. And for a character that only existed to die, she got a heck of a lot of screen time before she finally did it. Of all the characters on the show this season, she is the one that has had the most consistent and well-rounded arc, from introduction to her death in this episode. She got to have a clear and concise purpose, potentially make the world a better place, have meaningful friendships and conversations, and then see her loved ones one more time before she died. It’s a touching story, well-written and incredibly well acted, and ultimately sort of feels like it means nothing in the end. She’s the one person Liv couldn’t save, yes, but the show isn’t really wrestling with the larger implications of the people Liv is saving as Renegade and what that means for New Seattle, which feels like a much more urgent issue. The trouble with Isobel’s story is sort of a microcosm of what iZombie is struggling with as a whole right now. The small scale bits are working fine. But when you take those small scale bits and try to fit them in this larger, whole world that the show is attempting to create from scratch, they don’t really add up to anything. There are larger implications to what every character is dealing with in their stories, but we don’t see any of those implications, just hear vaguely ominous threats about them in the background. There are also a multitude of moral implications to nearly every story that are dangling out there unaddressed. As the season’s story comes to a close, it’s these things that most need to be the focus. iZombie was renewed for season five! As frustrated as I am with this season right now, I’m very pleased we get to see these characters again and have more stories from these writers. The murder and murder victim are so inconsequential in the episode that it almost feels like they could have left it out completely. Germaphobe brain was hardly a blip on the radar, and the only good thing about it was the clever reveal that Blaine’s crying security guy was the murderer. Clive and Dale’s breakup is also victim of too many things in the episode for it to feel very significant. It was past time for it to happen so at least that is out of the way now. Angus’ assassination attempt scene might not have worked, but everything about Don E the director was gold. Bryce Hodgson is such a great addition to the cast. Peyton going to D.C. was confusing because I thought people could not leave New Seattle! I guess she gets some sort of important person immunity from this rule? Ravi met Peyton’s parents! It is nice to get a little stable relationship normalcy in between the very small fragments of everyone else’s love lives we usually get to see. Liv dressing as Peyton seems like it will have to come back to mean something later. Otherwise why have that whole sequence? Timeless ends its season with a finale so good, it can&apos;t be cancelled… right?